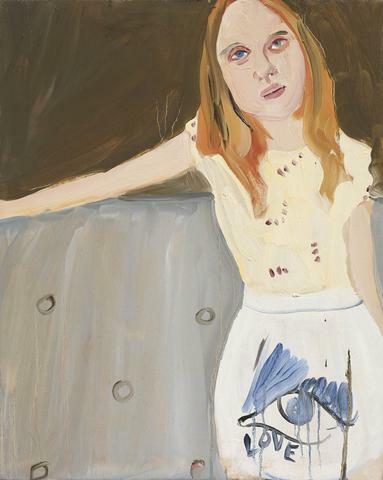 Cheim & Read is pleased to present an exhibition of new works by the American-born British painter Chantal Joffe. The show will open on May 25 and run through June 30. With influences ranging from Piero della Francesca to Edgar Degas and Francis Bacon, Joffe has based her work on a direct and intimate observational relationship between the painter and her sitter. She is also engaged in a continuing series of candid, often searing self-portraits, and tender double portraits featuring herself and her daughter, Esme. In the current exhibition, the artist paints women and girls alone, with the exception of “Self-Portrait with Esme in a Striped Nightie,” which contrasts the soft ovals of the artist’s nearly naked body with the horizontal blue-and-white stripes of her daughter’s nightgown. Within this relatively narrow subject area, Joffe experiments wildly with form, color, texture, and approach. Born in 1969 in St. Albans, Vermont, Chantal Joffe moved to the UK as a teenager and currently lives and works in London. She holds an MA from the Royal College of Art, where she studied with Peter Doig, among others. Joffe’s work is in the permanent collections of the Cantor Center for Visual Arts at Stanford University, Stanford, California; the Institute of Contemporary Art, Boston; the Metropolitan Museum of Art, New York; the Museum of Fine Arts, Boston; the National Portrait Gallery, London and the Scottish National Gallery of Modern Art, Edinburgh.